Mary Lovell Swetnam, Special Collections Librarian, Virginia Beach Public Library, was selected as the 2019 recipient of the Reference and User Services Association’s (RUSA) History Section’s Genealogy / History Achievement Award, sponsored by ProQuest for her enthusiastic service and commitment in helping her patrons with genealogy and local history research; for her dedication in helping preserve the local history of her community through the archival record. The award consists of a citation and $1,500* to a librarian, library or publisher, in recognition of professional achievement in historical or genealogical reference, service, or research librarianship. 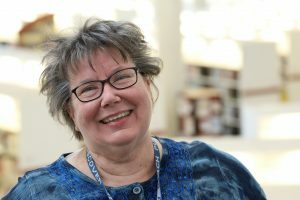 Mary Lovell has served as the Librarian in Charge of Archives, Local History and Genealogy at Virginia Beach Public Library (VBPL) since 1990. Her passion for librarianship, for the special collections she manages, and in serving the Virginia Beach community, is as evident today as it has been for the more than three decades she has worked in libraries. Her enthusiasm, dedication, and commitment to customer service are always present, whether working with a beginning genealogist, a Ph.D. candidate looking for information on the city-county merger, or a community organization considering donating items to the Archives. She has worked extensively with her community including digitizing whale and dolphin images from the Virginina Aquarium to aide aquariums and trackers in identification as the animals travel the Atlantic. She also worked with the Philipine Cultural Center of Virginia on a community archiving project which included training the organization’s volunteers to digitize and archive the materials of its members. Mary Lovell provides one-on-one assistance, reaches out into the community, and shares her knowledge and research skills with all. Her thirst for knowledge never fades and she attends conferences and webinars as often as possible. She does all this while continuing to provide daily face-to-face service at the Reference Desk. The selection committee includes: Jennifer Daugherty (Chair), Mary E. Bogan, Kristina S. Lang, and Jenny McElroy.